Most of us organic-ites are proud to say we eat organic food where possible, only use organic or natural skin care products and support eco friendly organic initiatives when we can. With the range of produce and products on offer these days it's easy to have a well-rounded organic lifestyle - that is one that's chemical and pesticide free. But what of those people who live beside a farm that is regularly sprayed with pesticides? Georgina Downs has lived for 24 years near land that has been exposed to these pest killers and suffered long-standing health related problems because of it. 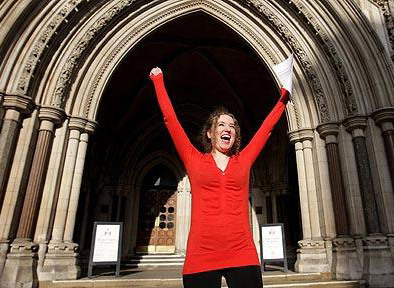 The environmental campaigner has been fighting for stricter government policies on the use of pesticides for the benefit of public health for some time and has finally had some success - in the High Court of Justice no less. To date there has never been an assessment of the health risks associated with long term exposure to the substances sprayed on crops. In light of Georgina's evidence, including three detailed Witness Statements, The High Court ruled that Defra (the Department for Environment, Food and Rural Affairs) must reassess its policies on crop spraying in rural areas and assess the risks to people that are exposed. The Judge in the case said that there was a strong case for no-spray zones around homes, schools and other public areas. Georgina Downs has moved us one step closer to winning the war on chemical pesticides.